This exam is designed to validate proficieny supporting Windows Vista client. 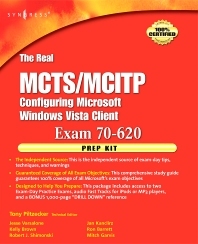 This exam will fulfill the Windows Vista Technology Specialist requirements of Exam 70-620. The Microsoft Certified Technology Specialist (MCTS) on Windows Vista credential is intended for information technology (IT) professionals who work in the complex computing environment of medium to large companies. The MCTS candidate should have at least one year of experience in Tier 1 or Tier 2 phone support in an upper midsize organization or enterprise environment. MCTS candidates should have experience resolving issues concerning network connectivity, desktop operating systems, security, and applications. Their experience should also include addressing logon problems, performing password resets, and resolving most issues with desktop applications. This book is intended for IT professionals seeking certification on the Windows Vista desktop operating system. Tony Piltzecker (CISSP, MCSE, CCNA, CCVP, Check Point CCSA, Citrix CCA), is an independent consultant based in Boston, MA. Tony's specialties include network security design, Microsoft operating system and applications architecture, as well as Cisco IP Telephony implementations. Tony’s background includes positions as Systems Practice Manager for Presidio Networked Solutions, IT Manager for SynQor Inc, Network Architect for Planning Systems, Inc, and Senior Networking Consultant with Integrated Information Systems. Along with his various certifications, Tony holds a bachelor’s degree in business administration. Tony Piltzecker is an independent consultant based in Boston, MA, and author of a number of books published by Syngress. Tony's background includes positions as Systems Practice Manager for Presidio Networked Solutions, IT Manager for SynQor Inc., Network Architect for Planning Systems, Inc., and Senior Networking Consultant with Integrated Information Systems. Tony has also been published in over 20 magazines, and has spoken at various events on topics ranging from IT security to unified communications.